In many ways ‘Velocity 2X’ is FuturLab’s love letter to the games they played growing up. It’s a beautiful fusion of ‘Metroid’ and ‘Flashback’ style platforming mixed with vertical space shooter sections that echo the likes of ‘Sub-Terrania’, ‘Aleste’ and ‘Radiant Silvergun’. But while ‘Velocity 2X’ might be a game made up of two distinct play styles it has been crafted with such care and precision that they blend together effortlessly. The result is one of the most addictive and enjoyable games you can play on the Switch. ‘Velocity 2X’ is a game that seemed destined for the Switch, even though its journey to the console started out in 2012 when Nintendo were interested in Dual Screen rather than Hybrid consoles. Described by Edge Magazine as the “Standard Bearer” for the Minis service, ‘Velocity’ was so good it began to get compared to full price PSP games not just the budget Minis range. 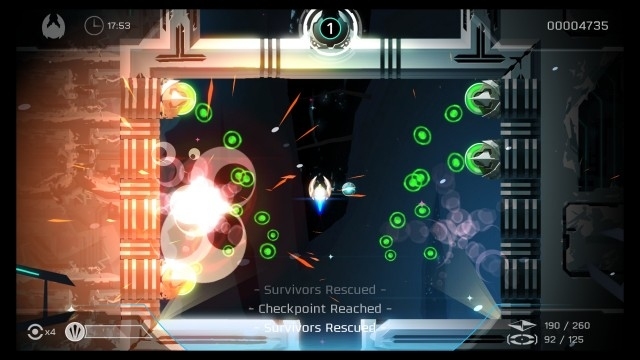 “‘Velocity’ is an exceptional (and in many ways) ground breaking game” said Gamestyle. “To call it the best Mini out there is doing it a disservice. In truth, ‘Velocity’ is a must have game on whatever system you can get it on”. Edge Magazine continued to be impressed with ‘Velocity Ultra’. 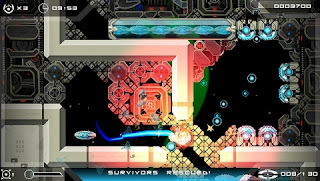 “It’s a game that leads by example, never keeping still while making sure you do likewise, and is every bit as essential now as it was 12 months ago.” But while modernising the Amiga style visuals was required, the reason for the ‘Velocity’ series’ popularity is simply down to the fact the core game play is superb, the controls are tight and it’s compelling. “Once you’ve found a mechanic that’s fun, the key is to build depth around that central mechanic without complicating things unnecessarily” notes Mardsen. “I think many game designers spend too much time pinching aspects of other games and trying to stick them together instead of focusing deeply on making the most of what is right in front of them.” The strength of a ‘Velocity’ game is its incremental additions to gameplay. In all games the main play mechanic centres on your ability to teleport through walls, but this simple premise is built on incrementally. 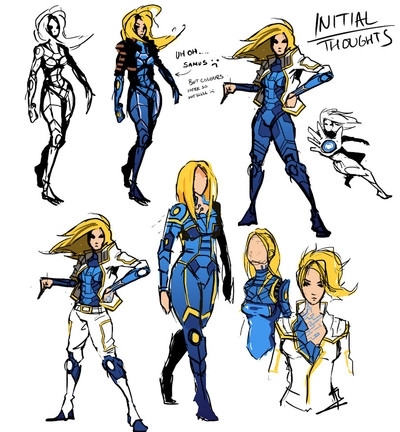 “We drip-feed the mechanics through the game over time because and we want you to become comfortable with the mechanic before we introduce something new” says Kirstie Rigden the game’s design director. “We’re nvot overwhelming you right at the beginning with all the different mechanics and also it would be really boring if we gave you everything at the very beginning of the game. On Level 36 you're still learning something new”. The strength is the fine balance: the moment boredom is about to set in you’re given a new distraction and then allowed the time to master and enjoy this. “You can carry a simple fun mechanic a long way if you really study the limits of that mechanic and build an experience around it” clarifies Marsden. “The best games begin simply and carry a player into complex sophistication. They are the best because the player learns all the way through, and never gets bored”. The vertical shooting sections of ‘Velocity 2X’ are practically identical to that of its predecessor ‘Velocity Ultra’. 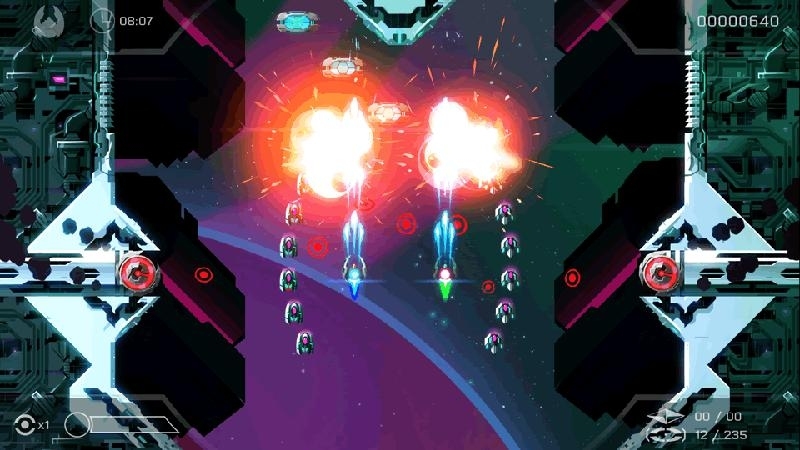 “Aside from tuning the controls based on player feedback, adding speed boost pads [...] and the all-important boss battles, it’s the same racy, shooty, teleporty fun” boats Marsden. The basic goal of each level will be familiar to anyone who has played a vertical shooter. You must travel from the bottom of a stage to the top, shooting or avoiding foes and obstructions. Some levels will demand you rescue prisoners trapped in pods, others must be navigated within a tight time limit. “Much of the campaign is spent cutting paths through collapsing space stations and chipping away at looping enemy chains in a manner suggestive of Amiga-era shooters” claimed Edge Magazine. Unlike those dated scrolling shooters though, there’s exploration to be done in ‘Velocity 2X’. Coloured targets must be hit to open different paths through a stage. 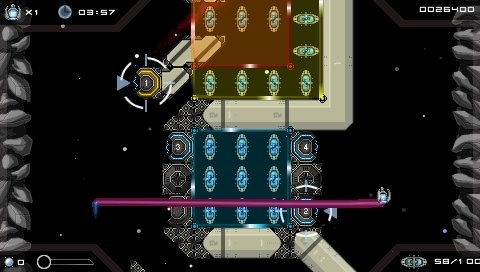 While the screen perpetually scrolls, in later levels you will have to manually place a telepod. These function a bit like player defined continue points. Should you reach a dead end in a stage, you’ll have to return to an earlier placed telepod hoping that your actions have opened a new route through the stage. While the final stages do get complicated, maps provide guidance and there’s an emphasis on finishing levels quickly; hence the title of the series. The quicker you finish a stage, the more enemies you kill and the more prisoners you rescue, the greater the experience points you earn. This XP is then used to gain access to new levels so replaying a stage once you’ve memorised the optimal completion method is always a good idea. However, certain mechanics that work well in a vertical shooter game simply don’t translate well to a platformer. 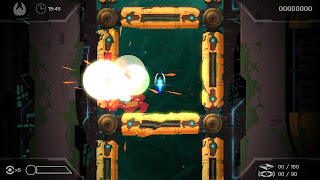 “In the top-down [shooting section] you've got teleport so you can pick up a position on the screen that's free and teleport to instantly which is great fun” suggests Marsden. 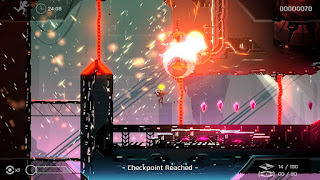 “We can't really do exactly the same on a platformer because the point of the platformer is you have to move to certain areas of the screen by jumping. If we allowed the player to do that instantly it would kind of render jumping pointless.” While this sounds catastrophic to a game that’s central gimmick is the ability to teleport, the compromise creates a fantastic platformer specific mechanic that really brings something new to the genre. “We’ve limited the distance that you can teleports to.” So while you can’t magically appear anywhere on screen any more, you can pass through some walls, floors and ceilings. Once mastered, you’ll use this ability to gain access to new areas while also depending on it to avoid danger. It means that ‘Velocity 2X’ has platforming stages where the usual player limitations are, in part, removed. You quickly start to think about how you can make your way through a stage by not only leaping over obstacles, but also considering if you can pass through them. Like the shooting sections there’s a great deal of skill required to do a level at speed, but there are also more thoughtful puzzles scattered throughout the game. 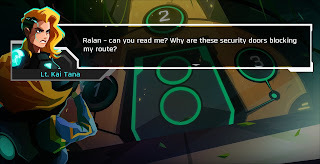 According to Marsden “in the top-down section you've got telepods which are a personal checkpoints and [we’re] doing something similar in the side-scrolling where you can fling a telepod and you can teleport to that, which creates some really cool interesting game play”. As the levels pass, you’re frequently tasked with more complicated ways to use the telepod throw. Often you’ll have to ricochet it against walls, sometimes you’ll have to use the telepod mid air after throwing it, and occasionally you’ll have to drop it so it can pass through a tube below you. 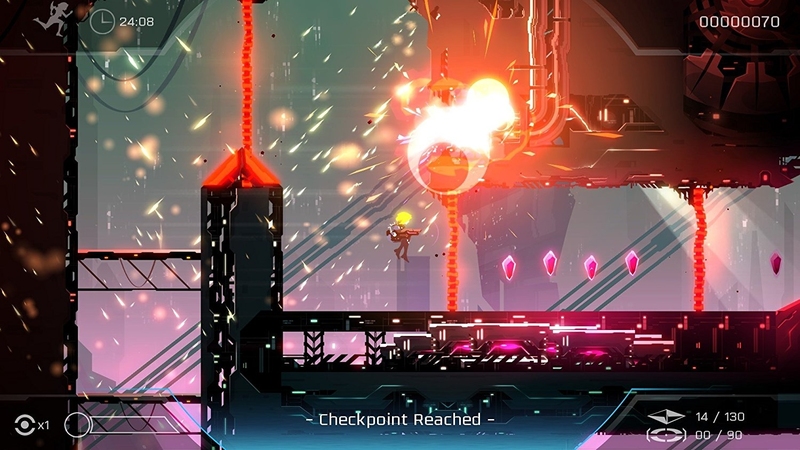 The components of the platforming are cleverly sympathetic to the shooting stages, without being enslaved to them. What works in the top-down sections exists in the platformer stages, what doesn’t has been adapted while still feeling familiar to a player. “We are pretty confident that taking the mechanics of a shooter and adding them to platform game play has worked” claims Marsden. “When you get good at ‘Velocity’ it feels like you are dancing through the levels” adds Rigden. After the events of the previous game, your protagonist Kai has been captured and had cybernetic implants surgically grafted onto her body. Kai is witty sassy and fearless; a Samus for the modern age. 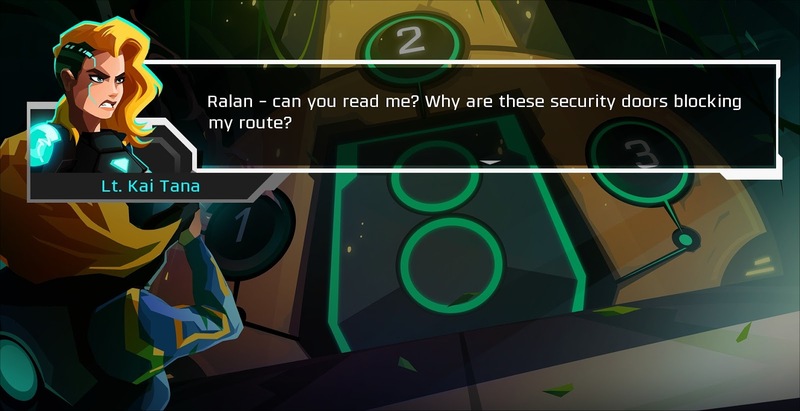 The plot gradually develops through short visual novel style intermissions between levels but it is awash with Science fiction clichés involving alien dictators and downtrodden slave races. “Part of fleshing out a more engaging story is having a good villain, ours is a 15-foot monster that owns and operate that part of the universe that you've arrived in” gloats Marsden. ‘Velocity 2X’ is essentially a story about how Kai escapes this villain and his Vok army, to eventually return home. It is at least engaging and well written and by the end of the short 8 hour campaign you do engage with Kai and her plight. This journey takes Kai through a number of environments, and ‘Velocity 2X’ is visually much more varied than its predecessor. “So for example one of the environments is very jungle” notes Ridgen. “It's your typical lush green planet but [throughout the game] we were really able to play with the colours” adds Hamilton. “We really got some really interesting level [artwork] for both the top down and the platforming sections”. For Marsden an aesthetic leap for sequel was essential if ‘Velocity 2x’ was to succeed. “It was very important to me to bring a lot of visual Dazzle”. The dazzle was bought by Hussain Sheikh. “My whole job interview was based around what I could do to make the explosions look better” claims Sheikh. The original PSP Minis ‘Velocity’ had a single sprite used when a ship explodes. 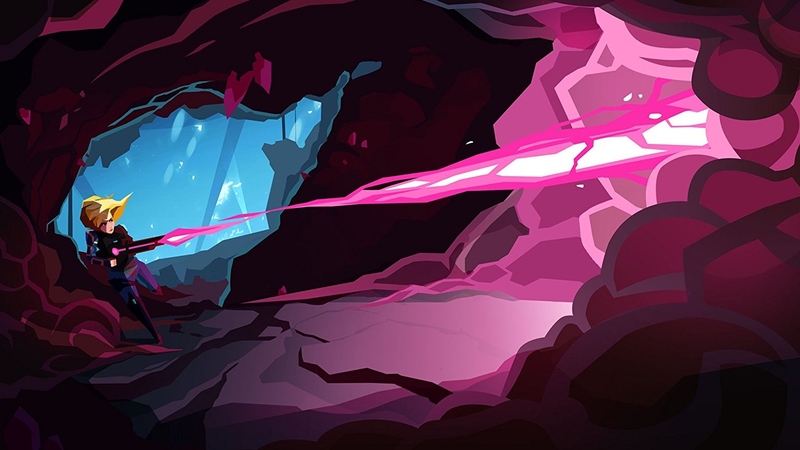 For ‘Velocity 2X’ the death of an opponent is celebrated with particle bursts, bloom, environment distortion, light halos and lenses flare inspired by Sci-fi film directors. “Since the release of J.J. Abrams’ ‘Star Trek’ in 2009, people noticed just how much lens flares were synonymous with sci-fi” says Sheikh. “ Carrying that baton forward, we decided to go full on J.J. Abrams crazy with lens flares on ‘Velocity 2X’.” In motion the game looks superb, and tragically many effects were originally diluted for the PSVita release. They were restored in the PS4 release however and thankfully this is the version that has arrived on the Switch. Publisher Curve Digital called the Switch Version of ‘Velocity 2X’ “The ultimate version”. While this may be because it includes the games DLC, but it could also be because the Switch is the perfect system to house ‘Velocity 2X’. When the console is docked you get to see all the visual splendour on a big TV and hear the fantastic soundtrack on surround sound speakers. 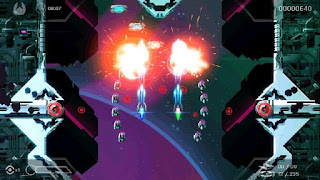 But then you can also take the game with you and enjoy it in short burst in hand held mode. 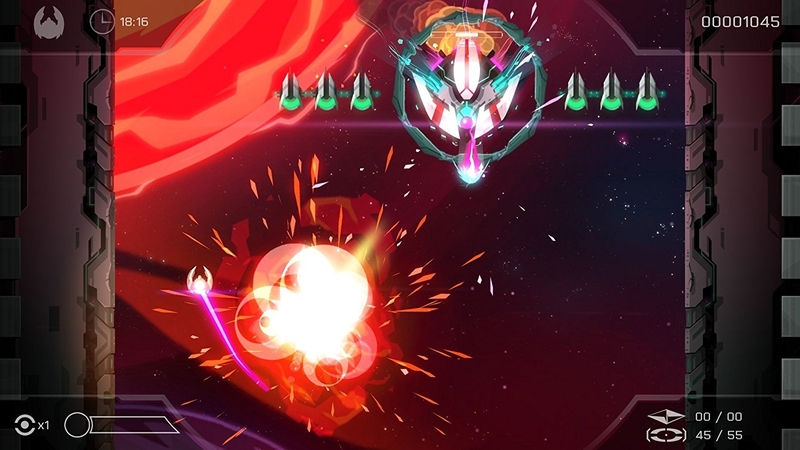 “There’s nothing else quite like FuturLab’s games” says The Gamer Hub’s Vaughn Highfield. “Their unique take on portable gaming has produced some of the finest titles you can play in the palm of your hands.” Most of ‘Velocity 2X’s levels can be completed in minutes, so it’s great for a short bus journey or a prolonged toilet visit. But equally, if you’re anything like me you’ll find entire train journeys are swallowed up by an obsession with getting one medal on a very hard stage. The arrival of ‘Velocity 2X’ on the Switch comes at a crucial time for the series, which is now 6 years old. “If you want to see the bells and whistles sequel to ‘Velocity2X’ that we have been working on in secret for years, you need to go out and buy ‘Velocity2X’ on Switch” declared FuturLab in a tweet. Their “truth bomb" says that because ‘Velocity 2X’ was originally given away for free on PlayStation Plus no one actually paid money for it. FuturLab says that while this was "great for downloads (well into the millions)" it’s not good for potential publishers of ‘Velocity Supernova’ who "want to see actual unit sales." 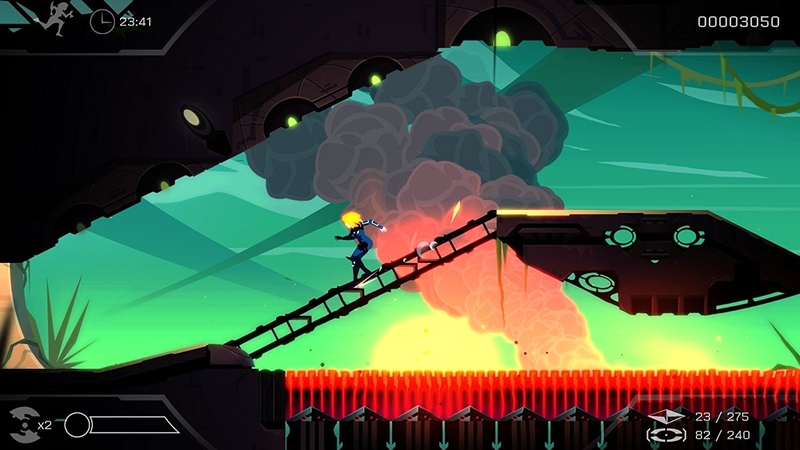 "We've tried, over and over and over to get a sequel signed," FuturLab posted. "It's the same every time. It looks and feels amazing, so everyone is interested. Until they see the actual sales of ‘2X’”. So if the Switch release of ‘Velocity 2x’ really is "your last chance to see a fully deserving sequel happen" at least it’s the best version of a sensational game. James Marsden once infamously claimed that ‘Velocity 2X’ will be many people’s game of the year – a bold statement considering that, at the time, the game wasn’t even released. Polygon and Gamestyle ultimately agreed with Marsden’s prediction giving the game a perfect score. I only hope that Switch players who have yet to enjoy the ‘Velocity’ games welcome it warmly, if only because I am selfishly desperate to play the final chapter in a series that I have come to adore. A copy of this game was provided by the publishers for review. They have not seen or had any influence on the content of this review prior to publication.